In the two previous "A Brief History..." posts, we've explored how Down syndrome came to be named, as well as looking at (pre)historical evidence of Down Syndrome. In a recent article, Washington Post reporter George Will published a photo essay about his son. It got me thinking... what other famous people have had a relative with Down Syndrome? At this point in time, there are many people with Down syndrome that are cherished by their famous family members. Included are: actor Jaime Foxx's sister DeOndra, actor John C. McGinley's son Max, Barnes and Noble CEO Steve Riggio's late daughter Melissa, Football coach Gene Stallings late son Johnny, and baseball superstar Albert Pujols' daughter Isabella (just to name a few). These much beloved people are fully integrated members of the family. Is this a product of this day and age however? Once again, being the most common genetic disorder and occurring in 1:700 live births, you would think there would be more information on those that had gone before. I went searching for historical figures and found quite a few. 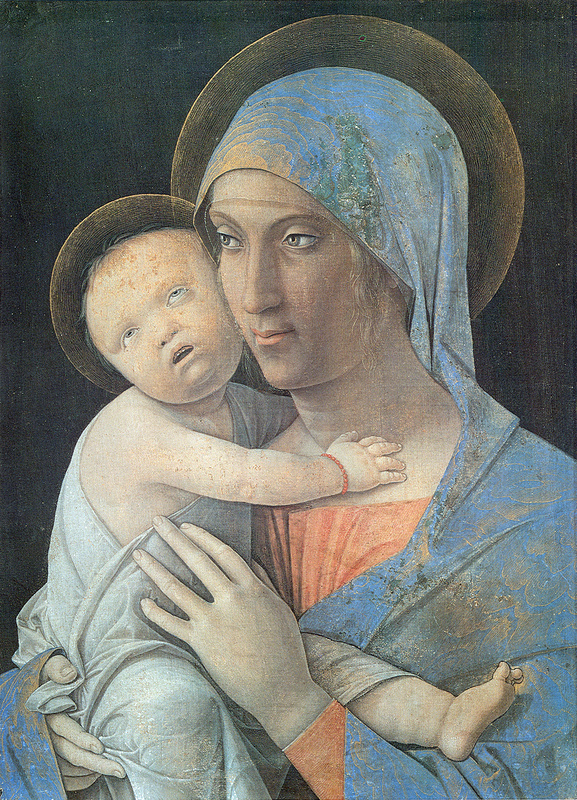 As I have mentioned before, it is rumoured that 15th century painter Andrea Mantegna, the artist who painted Virgin and Child with Saints Jerome and Louis of Toulouse and Madonna and Child had a child with Down syndrome, as did his sponsor Ludovico Gonzaga who employed him as his court painter. This has been suggested by numerous sources as playing a large role in Mantegna's appointment in Mantua. The Gonzaga child was described as having "an illness" and that Mantagna's child shared the same description. Anselmus de Boodt, mineralist, scholar and physician to Rudolf II of Prague had a sister with what was most likely Down Syndrome. Two panels of Gerard Davis' triptych Transfiguration depict the de Boodt family (the portraits themselves painted by Pieter Porbus in 1573) They can be found in the Onze Lieve Vrouwekerk (Church of Our Lady) in Bruges, Belgium. The panel on the left depicts his father (Anselmus de Boodt Sr.) with his seven sons. Anselmus de Boodt is depicted in the centre directly behind Anselmus Sr. 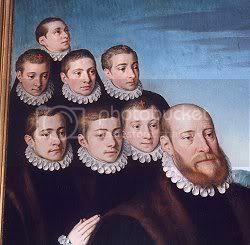 The red crosses on the heads of some of the children (just above the forehead on three of the boys) denote that these particular individuals were no longer alive at the time the portraits were painted. It is the panel on the right that is of interest here. 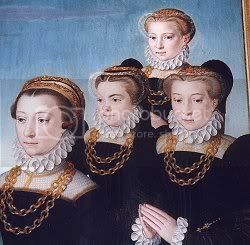 It depicts Anselmas de Boodt's mother Jeanne and his three sisters (one of which had also passed on as her portrait bears a red cross). It is the sister directly behind Jeanne that reportedly had Down Syndrome. Although little is known about her or her life, it cannot be denied that this portrait exhibits many of the hard markers of Trisomy 21, including a soft bridged, small upturned nose and epicanthal folds. Charles Waring Darwin was the 10th and final child of naturalist Charles Darwin and his wife Emma. It is suspected through description and the one surviving photograph that exists of him that he was born with Down Syndrome. "The poor little baby was born without its full share of intelligence. Both my father and mother were infinitely tender towards him..."
Looking at the photograph of the then 45 year old Emma and her newborn son, it is not hard to see what appears to be a "weakened" bridge to the nose and quite possibly be epicanthal folds. However, the photo is extremely grainy and we will never know for sure. Charles Waring Darwin passed away from Scarlet fever at 19 months of age, never having learned to walk or talk. Darwin Sr. recorded in his journal that day: "Poor Dear Baby Died." He was unable to attend the first reading and publication of his theory of Natural Selection due to the illness and death of his youngest son. "...must be a reversion to a type even further back than the Mongol stock, from which some ethnologists believe all the various races of men have sprung." This of course was taken one step further by his contemporaries who felt that this condition was a regression to the level of an orangutan. Despite his father's take on things (due, quite possibly to a degree of perceived grief), John Langdon Down the younger grew to be a much loved member of the family and died in the ancestral home at age 65. Crown Prince Wilhelm, or William as he was know throughout Europe, was the last crown prince of the Kingdom of Prussia. His fifth child and first daughter, Alexandrine (or "Adini") had Down syndrome. It is said that she was very much a part of the family, despite the popularity of the Eugenics movement at the time. family. There are numerous christening and family photos of her online, including some with her brothers and sisters. She was educated privately at a school for special needs students called Trüpersche Sonderschule in Jena, from 1932 to 1934. Rumors abound about her life after that. One version of the story states that she was institutionalized after the age of 20; proponents of this theory cite the lack of photographic evidence after that age. Another version has her living out the war in Niederpöcking in Bavaria and then retiring to a house near Lake Starnberg. Her death in 1980 indicates that she was spared Hitler's Aktion T4, quite possibly due to her royal heritage and her father's open support of Hitler through his rise to power. There is a distinct shortage of information on her adult life however, so it is unknown exactly how she spent the last 45 of her 65 years. General Charles De Gaulle is well known throughout modern history as the leader of the Free French Forces. What is not as well known is that his youngest daughter Anne (January 1, 1928 - February 6, 1948) had Down syndrome. Although public perception of the time was that children born with Down syndrome were a result of their parents alcoholism, venereal disease or overall degeneracy, the De Gaulles rejected this notion, choosing instead to raise Anne like their other two children. Their personal life became very private and Anne was raised at home, not in an institution (as was common practice at the time). It has been said often that Anne was Charles' favorite child. Described as a man who ranged from cocky to stoic by nature, he was a different person around Anne, reportedly describing her as "My joy". He is said to have read stories and sang songs to her and showed an affection that he rarely showed others, even those in his own household. Anne was raised to feel no less or different than anyone else. After the war, Charles and his wife Yvonne founded the Fondation Anne de Gaulle, a home for disabled girls, many of which had intellectual impairments. In 1948, Anne succumbed to pneumonia, a month after her 20th birthday and died in her father's arms. Upon her death, he is said to have remarked "Maintenant, elle est comme les autres." ("Now, she is like the others."). He carried a portrait of Anne with him at all times; he claimed that her portrait saved his life by stopping a bullet in an assassination attempt in 1962. When Charles died, he was buried beside his beloved Anne. In stark contrast to Charles De Gaulle is Arthur Miller. "The Broadway producer Robert Whitehead, who died in 2002, would tell Martin Gottfried that Miller called him on the day of the birth. Miller was "overjoyed," Whitehead said, and confided that he and Inge were planning to name the boy "Eugene"—possibly after Eugene O'Neill, whose play Long Day's Journey into Night, which had won the Pulitzer in 1957, had awed Miller. The next day, however, Miller called Whitehead again and told him the baby "isn't right." The doctors had diagnosed the infant with Down syndrome..."
"Arthur was terribly shaken—he used the term 'mongoloid,'" Whitehead recalled. He said, "'I'm going to have to put the baby away.'" A friend of Inge's recalls visiting her at home, in Roxbury, about a week later. "I was sitting at the bottom of the bed, and Inge was propped up, and my memory is that she was holding the baby and she was very, very unhappy," she says. "Inge wanted to keep the baby, but Arthur wasn't going to let her keep him." Inge, this friend recalls, "said that Arthur felt it would be very hard for Rebecca, and for the household," to raise Daniel at home. Another friend remembers that "it was a decision that had Rebecca at the center. Within days, the child was gone, placed in a home for infants in New York City. When he was about two or three, one friend recalls, Inge tried to bring him home, but Arthur would not have it..."
At the age of four, Daniel was placed in the Southbury Training School, once the choice of care for the rich and wealthy, it had degenerated by the 1970's. Living conditions were overcrowded, understaffed and generally horrific. Unlike most of the other residents, Daniel's mother visited him almost every Sunday. Arthur, it was reported, never wanted to visit. Daniel lived at Southbury until age 17 when, with the permission of his parents, he was allowed to live in a group home setting and gain some independence. By all accounts, Daniel blossomed after his release. A natural athlete, he became involved in the Special Olympics and competed in skiing, bowling, track and cycling. He became an active self-advocate and member of People First. It was through that organization that he finally met his father many years later. Both were attending an advocacy conference where Arthur was speaking; it was said that Miller was stunned when Danny ran over and gave him a large hug. "The following year, Rebecca Miller married Daniel Day-Lewis, whom she had met on the set of the movie adaptation of The Crucible. Day-Lewis, says Francine du Plessix Gray, "was the most compassionate about Daniel. He always visited him, with Inge and Rebecca." Some say he was "appalled" at Miller's attitude toward his son, and it is possible that Day-Lewis influenced Miller to make his first appearance, sometime in the late 1990s, at one of Daniel's annual "overall plan of service" reviews. The meeting was held in Daniel's apartment and lasted about two hours, Godbout recalls. As Arthur and Inge listened, the social workers who worked with Daniel discussed his progress—his job, his self-advocacy work, his huge network of friends. Miller "was just blown away," Godbout recalls. "He was absolutely amazed at Danny being able to live out on his own. He said it over and over again: 'I would never have dreamed this for my son. If you would have told me when he first started out that he would get to this point, I would never have believed it.' And you could see his sense of pride. Danny was right there, and he was just beaming." Miller did not attend another of Danny's year end reviews, nor did he attempt a relationship with his son. When Arthur Miller died, he did bequeath Danny a full quarter share of his estate. Unfortunately, this disqualified him from any government assistance and left him open for the state to attempt to reclaim monies from past care. Which happened, shortly thereafter. As of 2007, however, Danny still lived in a home with an elderly couple that take care of him and consider him part of the family. Beyond Miller, de Gaulle, et al. As it is the most common genetic disorder, there have probably been many famous people with a relative with Down syndrome. Due to public perception (and persistent misinformation), it is within the realm of reason to believe that there are many that we will never know of. There are probably thousands born to the cultural elite in the last two centuries that have been given away, institutionalized or simply killed outright. We will never know. However, it is very heartening to see that in the face of doing "what is done", many people of note have chosen instead to raise their child as any other. With the exception of Arthur Miller, I have presented several families that have chosen to welcome and nurture, instead of discard. As a result they have been able to see for themselves the uniqueness and joy that having a family member with a little extra can bring. It is a Charles de Gualle quote about his daughter that I think of most often in my own life with my son. Since Wyatt's birth I seem to be a changed person, to be more aware and more sensitive to the world around me. I have spoken many times how my son's smile or the smallest of accomplishments can lift my spirits and give me energy. De Gaulle too must have felt this way as he said once of Anne: “She helped me overcome the failures in all men, and to look beyond them.”. It is my hope that pioneers like de Gaulle, Crown Prince Wilhelm, Darwin and even the de Boodt, Gonzaga and Mantegna families will help us, as a society, overcome the failings of those that have gone before, so that we may provide the brightest future possible for those with Down syndrome. Andrews, Suzanna, Arthur Miller's Missing Act, Vanity Fair, September 2007. Baker, Graeme, Arthur Miller had a secret Down's syndrome son, The Telegraph, August 21, 2007. Baur, Patricia E, Public Man, Private Father, Patricia E Baur: News and Commentary on Disability Issues, June 4, 2007. Litchfield, Henrietta E., "Chap. XII." Emma Darwin, A century of family letters, 1792-1896. Lost Hospitals of London, Normansfield Hospital, date unknown. Geiss, Herbert, The Perfect Jeweller - Anselmus de Boodt at the Court of Rudolf II, Friends of Jade, November 2006. Nicol, Caitrin, At Home with Down Syndrome, The New Atlantis, Spring, 2008. Steensma, David P., Down Syndrome in Down House: Trisomy 21, GATA1 mutations, and Charles Darwin, Blood, vol 105, no. 6, pg. 2614-2616. Ward OC. John Langdon Down: The Man and the Message. Down Syndrome Research and Practice. 1999;6(1);19-24. This is an incredibly informative and enjoyable article! I am awed by the time and effort it must have taken to put this together -- it's beautiful! Thank you for sharing! I have always wondered about this exact thing. This post just made my day, week, month...! As a mom and a social worker, I know the value of seeing ourselves in history, literature, and the arts. People we can identify with. People who "look like us." Kids who are adopted, minority children of all stripes, and kids with anything "unusual" going on in their life need to see images of other kids who look like them and to hear stories of other kids like them. 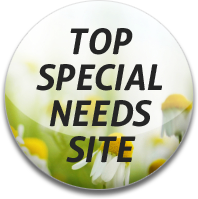 Here is a wonderful gift for families and kids who have or know someone who has Down syndrome. As my daughter grows, I will share these tidbits from history with her. Thank you for this gift. You are more than welcome. Thank you for stopping by with your kind words! This is fascinating! Thank you! You never fail to inspire, Jen...what an amazing article. Thank you so much for sharing this, 'our' history, to learn from-to be uplifted by. Your hard work and dedication are so appreciated by myself and countless others. Mama, you ROCK. Jen I had no idea when I started reading your blog that you are a psychiatric nurse. Having worked closely for 10 years with psychiatric nurses I just have to tell you that I have a tremendous amount of respect for them. In a way this is pretty devastating for me, you've singlehandedly ruined my image of a literary great (and Am Lit is my educational background), and made *me* admire a nazi-symphatiser. Wow... thank you so much for your research & the time you have out into this. I had no idea, but had often wondered about 'high profile' people having children with Down Syndrome & how much we knew about it. I'm going to share the link to your blog for others to read. Thanks Jen. I hope your Wyatt & my Gracie grow up to be self advocates & advocates for others also. I can feel the love Charles De Gaulle had for his daughter, Anne when I see the pictures of them together. Thank you so much for taking the time to tell me this. Your comments have helped make my day! Thank you so much for the update. I had a hard time researching her as I do not speak more than a handfull of German. What do world class boxing and the Special Olympics have in common? Joey Giardello. Philadelphia, 1954: Joey Giardello skyrockets toward the Middleweight Title. Then his world crashes: He learns his second son has been born with Down syndrome. He goes out with some friends to drown his troubles and ends up in prison for his role in a brawl. With no income, his career in ruins, and now a retarded child to care for, Joey makes the decision to battle his way to the Title and to use the clout he gains to help people with special needs. My Way, the greatest untold story of Boxing’s Golden Age, is a love story about hard-won victory and redemption based on the life Joey Giardello, Middleweight Champion of the World, 1963-1965. Proud mother of David Fisk, who has Down syndrome. Thanks for pointing this out. I would suggest dropping the R word however. Although historically accurate, it's not endearing us to him. Good luck with your screenplay. Hi Patricia! Thanks for stopping by! Roy Rogers and Dale Evans also had a daughter with Down syndrome and there is a book about her called "Angel Unaware." Roy Rogers and Dale Evans had a daughter with Down syndrome. Although discussion is encouraged, disrespectful or hurtful dialogue will be removed. Spam will be fried up with a side of tomatoes. Join Down Wit Dat's Online Communities! "Just wanted to let you know how much I admire you. I know you fight a lot of demons, both yours and for others, yet you still maintain that fantastic sense of humor, and more importantly, fairness. You are a constant source of light in the darkness, because you are beautiful inside and out..." - S. R.
"Jen and her family have an amazing story and mission. Jen's writing reflects the difficult and triumphant steps of life with a special needs child; twins at that, and a older sibling. Thank you for sharing your families' strength with the on-line community."--S.B. All images and text (c) 2014 PsychoJenic, unless otherwise specified. Powered by Blogger.